Considering an Italy honeymoon? You’re on the fast track to one of the most romantic experiences of your life. For a country that will romance you with wine, dazzle you with culinary feats, and amaze you with charm and beauty, there is nothing quite like having an Italy honeymoon. As one of the most beloved nations in Europe, newlyweds cross the ocean to stroll through Rome, Venice and Milan, sip on vino in Tuscany and Pisa, or watch sunset-after-sunset on the coast in Naples or Amalfi. It isn’t hard to fall even deeper in love in this one-of-a-kind region, but planning your Italy honeymoon itinerary can be tricky. Luckily, we’ve done the research for you and have everything you need to know about planning an Italy honeymoon in this remarkable part of the world. Thanks to the mild weather, it’s always a great time of year for a honeymoon in Italy. But if you’re looking to save money or steer clear of tourists, we highly recommend booking a trip to Italy from April to June or September to October for comfortable temperatures, fewer people, and best of all, lower prices. If you’re comfortable with cooler breezes, there is something to be said about a November and December Italian honeymoon too, where you’ll be bundled up together and happily exploring a country you’ve both always dreamt of seeing. Just remember, wherever and whenever you go, prepare your liver for all the wine tasting! Live out your Under the Tuscan Sun romance in this picturesque beach town. Wander down the cobblestone streets lined with colorful buildings and you’ll find local art galleries, churches, and of course, pizza. 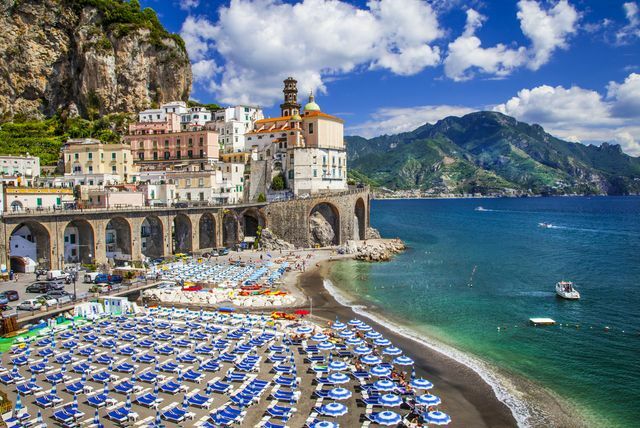 And no trip to the Amalfi Coast is complete without a day (or five) at the beach: Rent a beach chair for €10, order a glass of rosé, and soak up the Italian sun. But if you’re the type of couple that gets bored sitting still, you can also rent paddleboards, kayaks, and snorkels for the day. Must See: Hike along the Path of Gods to get a full view of the Amalfi Coast and all of its beauty. Bonus tip: if you’re sneaky about it, you can even bring a few wine roadies for the trip. 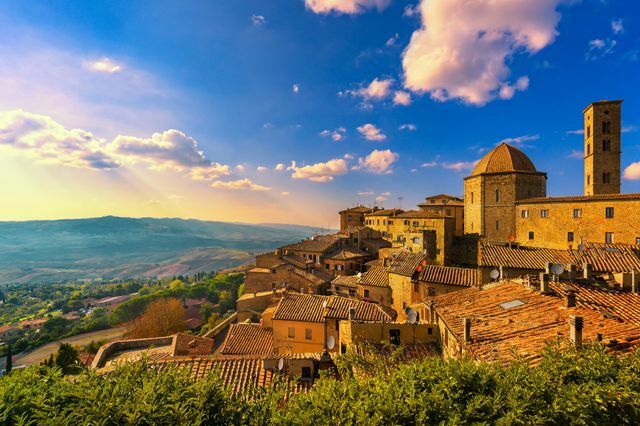 Get a mix of culture, architecture, and history in the capital of the Tuscany region and one of the top Italy honeymoon destinations. 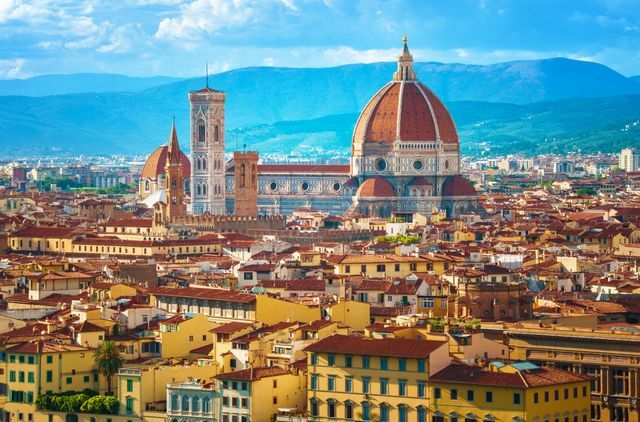 During the Florence portion of your Italy honeymoon, you can check the Duomo and Michelangelo’s “David” sculpture off your bucket list, while also enjoying some of the finest dining in the area. Although the renaissance buildings are larger than life, the city almost looks like a small town, giving off the rare “just like Grandma’s” feel. For romance bonus points, visit Ponte Vecchio overlooking the Arno River at sunset for an Insta-worthy moment between you and your S.O. Must See: Anything by Michelangelo, for obvious reasons. For some well-deserved post-wedding R&R, head south to Sorrento, a coastal town in southwestern Italy. 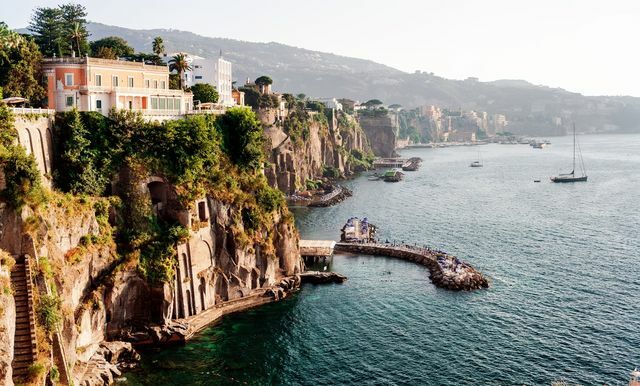 Perched atop cliffs that overlook the Bay of Naples, this area is popular for its top-notch hotels, breathtaking views, and world-famous lemon trees. While most of your Sorrento, Italy honeymoon should (and will) be spent kicking back at the resort pool, also make time to explore Old Town, sip on local Limoncello, and even take a day trip to Pompeii. Must See: If you can splash out for one night of luxury, stay at Grand Hotel Excelsior Vittoria. 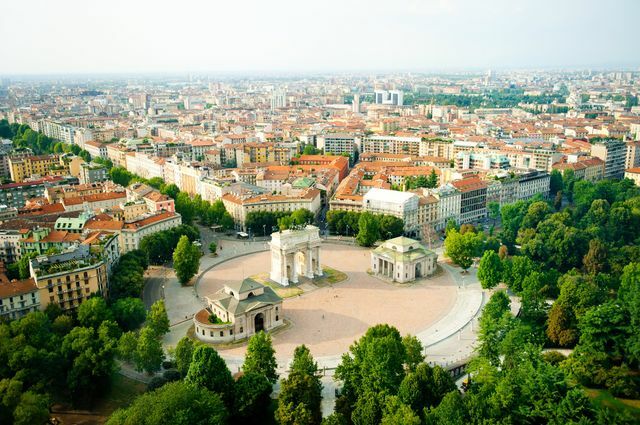 If you’re looking for drama, then Milan is a must-visit on your Italy honeymoon itinerary. While it’s not as historical as Rome or as quaint as Florence, it’s easily one of the most glamorous, fashion-focused cities in Italy. Milan Fashion Week, anyone? Back to you and your beau: For him, spend your time gawking at the beauty of Duomo di Milano and Leonardo da Vinci’s masterpiece, The Last Supper. For her, window shop at Galleria Vittorio Emanuele II, one of the world’s oldest shopping malls. Must See: Book your tickets in advance to see da Vinci’s ‘The Last Supper’ up close and personal. For a honeymoon in Italy, you can’t miss the one-and-only, Rome! Though definitely tourist-central as the capital of the country, it’s one of those Italy honeymoon destinations you have to see to believe. 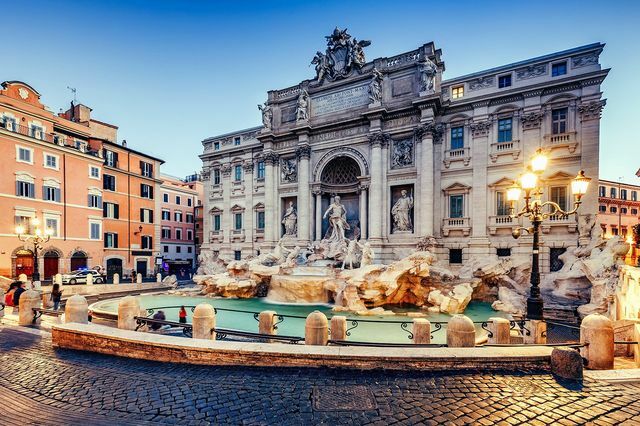 With ruins dating back hundreds of years, bustling city squares and works of art around every corner, you’ll be amazed at the deep beauty of old-meets-new in this Roman hub. Make sure you book tickets ahead of time for the Vatican and the Coliseum, as those book up quickly and you can avoid the lines. 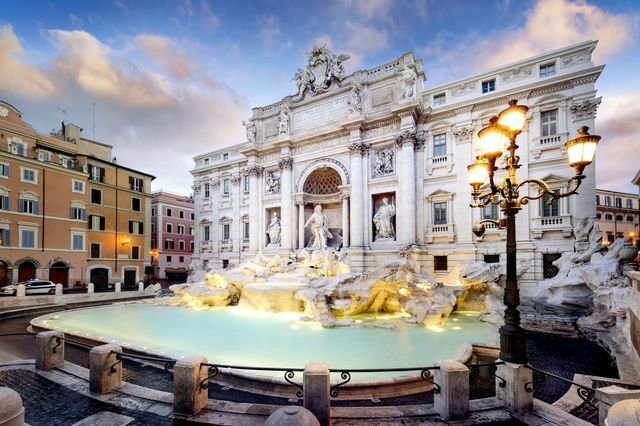 For your marriage (and possibly for the house you want to buy or the children you wish to have) — make a wish in Trevi Fountain during one of your nights in Rome for all the wonder ahead of you and your forever partner. Must See: The hagglers will definitely annoy you, but having dinner al fresco at Piazza Navona is a must. 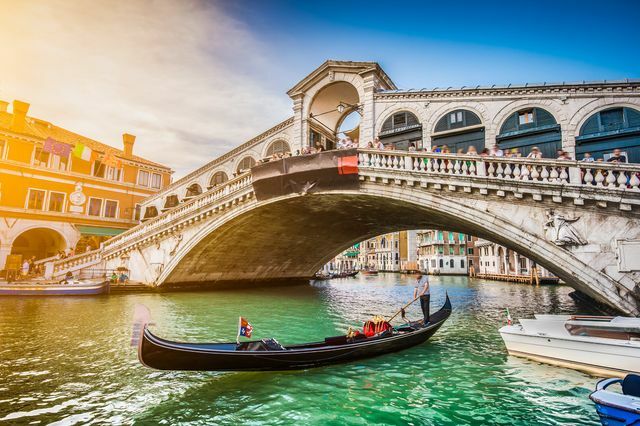 There’s a saying that you either love or hate Venice, but if you’re having a romantic honeymoon in Italy, chances are high you’re going to love Venice. Though it’s a city, the capital of Italy’s northern Veneto region is made up of one hundred teeny-tiny islands. As you stroll through the (often crowded) routes, you’ll notice there are no roads in Venice. Or streets. 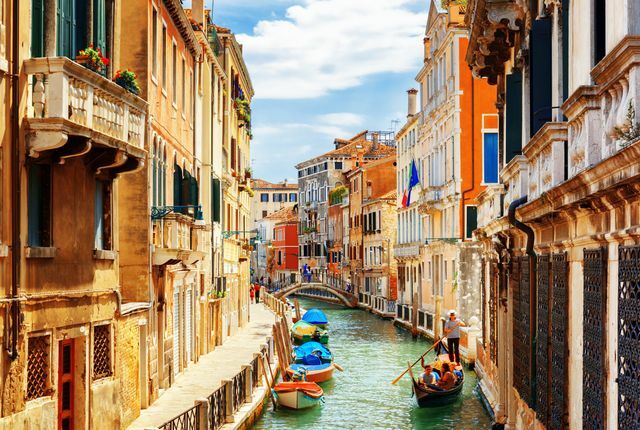 Rather, everything is made of canals, all dotted along the beauty of the Adriatic Sea. When you’re here, seeing St. Mark’s Square is a must, as well as one of those traditional gondola tour because hey, #wheninvenice. Must See: Climb to the top of the Campanile Bell Tower for a gorgeous view of the city. And if you want to venture a bit out of town, take a glass-blowing workshop to learn more about the art of this Italian town. Once you make it to Italy, the easiest way to travel between cities by train. There are many domestic flights within the country, but the prices will be much higher than railways. However, for more control over your trip, rent a car and drive at your leisure — just say ‘yes’ for insurance, since speed limits are much higher in Europe than they are stateside. When visiting a city, rely on public transportation or bikes to get from place to place. For the more coastal towns, you can walk or ferry from one dock to the next. Get the exhausting part of the trip out of the way first by flying straight to Milan. ...While you’re at it, you can make a pit stop for a day in Rome before heading to the next destination. 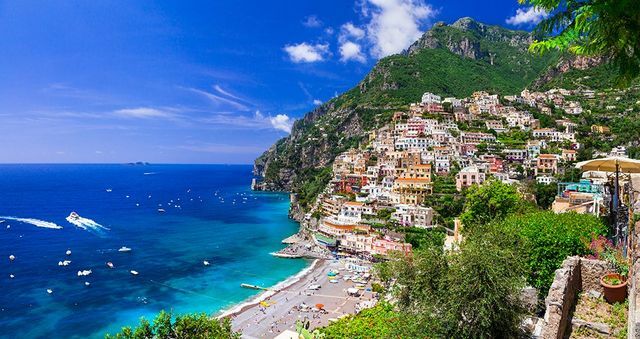 Save up to three hours of travel time by catching a flight from Florence to Positano — check prices before you leave. Just a 30-minute drive away, round out your trip with a relaxing few days in Sorrento. Last but not least, fly to Venice — a one hour one-way flight, starting at $35 — to end your trip with one last lick of romance. Italy Honeymoon - Destinations and Transportation?